The ordinary meerkat is an African enigma –cute enough to be immortalized as a Disney character with their own TV series. Although similar in appearance and behaviour, the yellow mongoose is a different animal altogether and can take down a mamba. These interesting creatures are relatively common around Namibia. You may even be lucky enough to see them from your accommodation in Windhoek. Although the red meerkat, or yellow mongoose are a different species (Cynictis penicillata) to their more famous cousins the meerkat (Suricata suricatta), they are often seen together and known to share accommodation on occasion. A group of these amusing animals have made themselves quite at home around Arebbusch Travel Lodge. They have been known to provide hours of entertainment for nature-loving guests – no DSTV required. Despite adapting quite well to living close to humans, the yellow mongoose is not as commonly found in built up areas as their famous namesakes. They are very common in nature reserves and parks and you are likely see them during your game drives around Etosha National Park and scampering around camp. In the wild, yellow mongoose live in colonies of up to 20 individuals. They communicate with each other mainly via soundless tail movements. When threatened, they growl menacingly and have also been heard to bark, scream and purr. Their burrows are built on dry open grasslands or arid scrubland and it is here where they bear their young and hide them from predators. Yellow mongoose are fearless and will protect themselves and their offspring with surprising confidence for such small creatures. Many a jackal or snake has met with a nasty surprise by sticking their nose where it just shouldn’t be. Birds of prey have an advantage and achieve more success when preying on these fast, fierce animals. 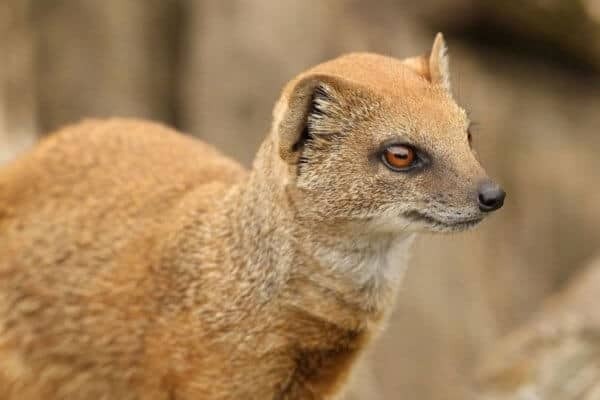 In turn, yellow mongoose are partial to eating snakes as well as insects, rodents and other reptiles. They will even eat carrion if pressed. Yellow Mongoose are just one of the incredible creatures you will come across during your travels to Namibia. Book your accommodation in Windhoek or make plans to travel to Etosha National Park and you could see these and even more amazing animals while visiting this southern African country.